1423 Sgt Herbert George Bealey of the 1st/6th Battalion, the Devonshire Regiment. Son of William and Bessie Bealey. Born in Dolton in 1889. Died 24 October 1916 age 27. 3642 Private Ernest Bolt of the 2nd/6th Battalion, the Devonshire Regiment. Son of Charles and Elizabeth Bolt. Born in Hatherleigh in 1896. Died 3 January 1917 aged 21. 15864 Private Thomas Bowden of the 8th Battalion, the Devonshire Regiment. Son of Elizabeth Bowden. Born in Hatherleigh in 1885. Died 6 October 1917 aged 32. 21014 Acting Lance Corporal William Denford of the Royal Engineers. Son of William and Jessie Denford. Born in Hatherleigh in 1891. Died in 1916.aged 25. 21000 Private Stanley Denford of the 2nd Battalion, the Prince Albert Regiment (Somerset Light Infantry). Son of Walter and and Denford; brother of Percy (below). Born in Hatherleigh in 1895. died for September 1916 aged 21. 12596 Private Percy Denford of the 8th Battalion the Devonshire Regiment. Son of Walter and Annie Denford; brother of Stanley (above). Born in Hatherleigh in 1891. Died 25 September 1915 aged 24. 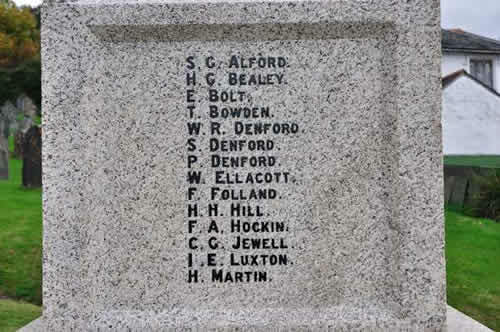 41372 Private William Ellacott of the 9th Battalion (Pioneers), the South Staffordshire Regiment; formally 203907, the Royal ngineers.Son of William and Jane Ellacott. Born in Hatherleigh in 1878. died 20 October 1917 aged 39. T3/024724 Driver Frederick Folland of the Royal Army Service Corps. Son of Ruben Folland and the late Annie Folland. Born in Hatherleigh in 1891. Died 28 January 1918 aged 27. 30317 Private Henry Havelock Hill of the 1st Battalion, the Devonshire Regiment. Son of Henry and Elizabeth Hill of Bridge Street, Hatherleigh. Born in Hatherleigh in 1889. Died 31 January 1917 aged 28. 11517 Private Frederick Albert Hockin of the 1st Battalion, the Devonshire Regiment. Son of James and Priscilla Hockin, of South Street, Hatherleigh. Born in Hatherleigh in 1897. Died 18 October 1915 aged 19. 50971 Private Cyril George Jewell of B Company, 1st Battalion, the Somerset Light Infantry. Son of William and Bessie Jewell of Park Road Hatherleigh. Born in Hatherleigh in 1899. Died 24 October 1918 aged 19. 230486 Private Isaac E. Luxton of the 10th Battalion, the Worcestershire Regiment. Son of Samuel and Laura Luxton. Born in Little Torrington in 1888. Died 22 March 1918 aged 30. 30571 Private Henry Martin of the 14th Battalion (West of England) the Gloucestershire Regiment. Born in Hatherleigh. 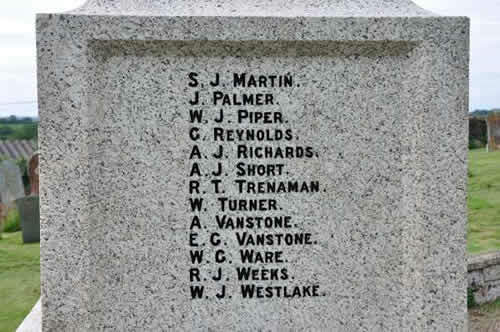 Died 22 October 1917. 200289 Private Sidney John Martin of the 1st/4th Battalion, the Duke of Cornwall's Light Infantry. Son of John and Mary Martin of Strawbridge, Hatherleigh. Born i n Hatherleigh in the March Quarter of 1889. Died 15 December 1916 aged 27. 3411 Private John Palmer of the 1st/ 6th Battalion, the Devonshire Regiment. No family information available yet. Died 22 August 1916. G68927 Private William John Piper of the 2nd Battalion the Royal Fusiliers (City of London Regiment). Son of William and Thirza Piper Born in Hatherleigh. Died 9 December 1917. 1658 Private George Reynolds of the 4th/6th Battalion the Devonshire Regiment. Son of Henry and Mary Reynolds Born in Hatherleigh in 1890. Died 22 may 1916 aged 26. 203627 Private Arthur John Richards of the 2nd Battalion the Devonshire Regiment. Son of John and Eleanor Richards of Monks Mills, Monkokehampton. Born in Shobrook in 1899. Died 24 April 1918 aged 19. 20388 Private Aso John Short of the 1st Battalion, the Devonshire Regiment. Son of John and Elizabeth Short. Born in Hatherleigh in 1899. Died 28 September 1918 aged 29. 11510 Private Thomas Robert Trenamin of the 3rd Battalion, the Devonshire Regiment. Son of Thomas and Elizabeth Trenamin of South Street, Hatherleigh. Born in Hatherleigh in the June Quarter of 1894. Died 2 October 1914 aged 20. Buried in the churchyard of St John the Baptist. Not yet confirmed. We believe this to be William Turner, son of Richard and Frances Turner of Darkey Lane, Hatherleigh who was born in Hatherleigh in 1896 but have no details of his military history. 19959 Sapper Ernest George Vanstone of 55 Field Company, the Royal Engineers. Son of William Vanstone and the late Ellen Vanstone; brother of Alfred (above). Born in Hatherleigh in the March quarter of 1889. Died 23 October 1940 aged 25. 2 to 6877 Gunner Richard John Weekes of C Battery 315 Brigade, the Royal Field Artillery. Son of Richard and Fanny Weekes of South Street Hatherleigh. Died 24 March 1918 aged 22. 12595 Private William Westlake of the 2nd Battalion the Devonshire Regiment. Son of William and Emily Westlake. Born in Hatherleigh in 1892. Died 1 July 1916 aged 24.